India were today grappling with a “good” problem of who would open the batting in the series-deciding third cricket Test starting here on Tuesday, with coach John Wright ruling out nothing, including retaining Aakash Chopra. Sourav Ganguly should open the Indian innings with Virender Sehwag in the third and final Test against Pakistan, but Aakash Chopra too should not be made a scapegoat, two former cricketers have said. “If Ganguly is to come back into the side, he should find a place on merit. Indian skipper Sourav Ganguly arrives for a practice session in Rawalpindi on Sunday. Another lively and grassy track awaits the Indian cricket team in the third Test against Pakistan, with the home team hoping to give their battery of fast bowlers the right conditions for a series-clinching triumph. Pakistan are considering the option of fielding a four-pronged pace attack against India on a grassy track in the decisive third Test starting here on Tuesday. Former Pakistan skipper Saleem Malik believes that he and former Indian captain Mohammad Azharuddin were made scapegoats in the match-fixing allegations that destroyed their respective cricketing careers, and to a large extent their lives as well. Off-spinner Harbhajan Singh, recuperating from a finger injury, is now fit to rejoin the Indian squad. He has started doing net practice at Burlton Park Stadium here. “Although I have totally recovered from the finger injury, to be in full rhythm in bowling, I plan to play in domestic as well as international tournaments, including Indian Airlines and county cricket, this month before joining the Indian cricket team”, Harbhajan told this correspondent here today. 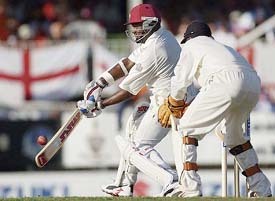 Brian Lara, using the easy nature of the Antigua Recreation Ground pitch, was within sight of his 25th Test hundred as West Indies enjoyed their best day with the bat against England on the rain-affected opening day of the fourth and final Test yesterday. Takao Suzuki and Gouichi Motomura posted reverse singles wins today as Japan came from behind to defeat India, 3-2, in their Davis Cup Asia/Oceania Group I clash. Indian came from behind to beat favourites Uzbekistan 3-1 in the second Asian Football Confederation under-14 Festival of Football tournament in Kathmandu, Nepal today. Tiger Woods has struggled to his worst Masters showing as a professional, unable to find sufficient form to stay in contention, much less the “A-game” to capture his fourth green jacket. National Highway 22 witnessed a treat of old vintage cars jostling for space with latest swanky cars and vehicles of all hues today. Participating in a Baisakhi drive for promoting tourism in this cantonment town, the local Kasauli Resorts, in collaboration with the state’s Tourism Department, organised this drive. Zonal cricket academy (under-19) , earlier functioning under the aegis of the BCCI in New Delhi, has been shifted at the PCA Stadium at Mohali. In a display of rank average hockey, Punjab & Sind Bank (PSB) defeated today Army XI 4-2 via tie-breaker to lift the Beighton Cup for the third time here. Along with the prestigious Cup, the PSB took home a Rs 1,25,000 cash award, while Army XI got Rs 75,000. The two losing semi-finalists Punjab Police and Corps of Signals (Jalandhar) got Rs 25,000 each. Federation Cup champions Mahindra United, Mumbai, staged a come-back to edge out former champions Salgaocar Sports Club Goa by 2-1 and kept their hopes alive for the title in the 8th edition of the National Football League championship match at Nehru Stadium Fatorda here today. The team’s think-tank, consisting of Wright, skipper Sourav Ganguly, his deputy Rahul Dravid and Sachin Tendulkar, would sit down to sort out the dilemma which has resulted from excellent performances of left-handed batsman Yuvraj Singh in the first two Tests against Pakistan where he played as a substitute for injured Ganguly who is now back into the team. “It is a good problem to have, an interesting problem. We all know that Yuvraj is very talented, his efforts have been outstanding, scoring a 59 and a century in the two Tests. But at the same time we know the importance of having a specialist opener,” Wright said. “(Virender) Sehwag was also a middle order batsman, but has been successful as an opener. So we have to decide who will do the job. It will be a right hander or a left hander,” he said. “The opening pair play a key role in the batting order, going away from the present combination will be difficult. The openers have to play out the entire first session and see off the new ball. Anyone can have two failures,” Wright said referring to Chopra’s poor outing in the second Test in Lahore which India lost by nine wickets. Wright also said that there would be toss-up between Ajit Agarkar and Ashish Nehra for the third paceman’s slot as Irfan Pathan and Lakshmipathy Balaji had done a good job in the series. “The discussion will be between Nehra and Agarkar. We may even contemplate going in with two spinners,” he said. On whether the Indians will be under more pressure going into the series-decider, he said “not really. Of course, there will some pressure because the score is 1-1. But may be it will help us in a way as the players know they have to play good cricket right through the match to be able to win it. “The key is to play well on all the five days. The batting had let us down in Lahore and I think we were about 100 runs short. At the same time, Pakistan batted well. 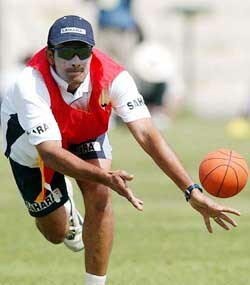 There are little things that turn the game, I think the run out of Dravid was on such thing,” he said. Wright said the team could have bucked the trend of losing a match immediately after a Test triumph overseas if they had batted well in the last game. Asked whether the injuries to some of the key Pakistani pace bowlers would be an advantage for the Indians, he said, it was not prudent to read too much into as the new bowlers could also be dangerous. Sourav Ganguly should open the Indian innings with Virender Sehwag in the third and final Test against Pakistan, but Aakash Chopra too should not be made a scapegoat, two former cricketers have said. “If Ganguly is to come back into the side, he should find a place on merit. Ganguly has opened in one-dayers for long and he should not hesitate to open the innings in this Test,” former Indian captain Bishen Singh Bedi said in BBC Hindi’s weekly sports programme ‘Khel Aur Khiladi’. “He should set an example and being the captain, should lead from the front,” Bedi said ahead of the series decider starting in Rawalpindi on Tuesday. “The need of the hour is that he offers to stick his neck out. He will have to deliver as a batsman and as the skipper”, Bedi said. “Aakash Chopra too should not be made a scapegoat as he has just failed in two matches,” he added. 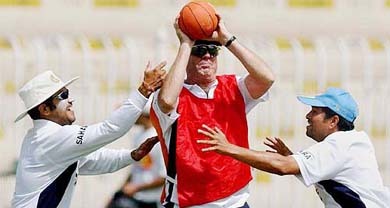 “Ganguly’s comeback will infuse new energy into the Indian camp. Their batting is still reliable and one bad match can not change that fact”, he said. “India will not get a better chance of winning a Test series in Pakistan. Pakistan should be happy with a draw. I think Irfan Pathan and Anil Kumble hold the key for India,” Mohammad said. “One bad match cannot put its reliability in doubt. It is essential that our bowlers do well. They will have to work hard and take 20 Pakistani wickets”, he said. “Now, the onus is on India to win because they have never won a Test series on Pakistani soil. India is a better team on paper and they are the favourites as well”, Bedi said. “Trying too hard may create problems, I will just bowl my natural self. I am not thinking about pressure at all. It is the media which is talking about pressure,” he said. “All those will be missed. India are definitely the favourites and Pakistan should be happy with a draw. They should have some grass on the Rawalpindi wicket. It will be good for Pakistan,” he said. The pitch at the Pindi Cricket Stadium, the venue of the decider, has lot of grass on it and indications are that a fast track will be prepared by the hosts. Although the track is still being prepared, it is expected that some of the grass will be left on it even after the groundsmen are through with their job. Unlike the track at the Gaddafi Stadium in Lahore, where the turf was dry in nature, the pitch here has a more greenish tinge, which will help the fast bowlers, especially in the opening session of the match. Neither English curator Andy Atkinson, overseeing the preparation of pitches in Pakistan, nor local expert Mohammad Bashir, are willing to comment on how much grass will be left on the track. The Indian cricketers, who came to the ground for net practice in the morning, had a close look at the track, though they would have to wait till tomorrow to get a clearer picture of the pitch. Coach John Wright said it was still early to comment on the pitch, but predicted a Lahore-type wicket, which would assist the bowlers in the initial stages. “It will have a little bit for the bowlers in the early stages. It will be critical to bat well till the lunch break, and after that it may ease out. It appears to be somewhat similar to the Lahore track,” Wright said. The Pakistan Cricket Board (PCB) took charge of preparing the track after the Multan turf raised a storm and was blamed for Pakistan’s debacle in the first Test. PCB chairman Shaharyar Khan had indicated that lively tracks would be prepared for the rest of the series after criticism that the Multan track did not aid Pakistani pacers. Pakistan are considering the option of fielding a four-pronged pace attack against India on a grassy track in the decisive third Test starting here on Tuesday. With Mohammad Sami being declared fit for the decider, Pakistan is considering the option of giving Test debut to all-rounder Rana Naveed-ul Hasan and recalling pacer Fazle Akbar after the two impressed during the nets this morning. Pakistan was forced to look up to these untested bowlers after their Lahore match hero Umar Gul was ruled out due to a back injury. Pacer Shabbir Ahmed and Abdul Razzaq, who did not play the Lahore Test, have yet to recover from their injuries. “We have not reduced the 17-man squad to 15 but it is more likely that we will drop Rao Iftikhar and Abdul Rauf from the 17,” said captain Inzamam-ul Haq today. If Pakistan play with four seamers and leg-spinner Danish Kaneria then they will have to drop either out-of-form Taufiq Umer or the impressive Asim Kamal. If Taufiq is dropped then Yasir Hameed will be asked to open the innings. Naveed played in the first of five one-day internationals which India won 3-2 last month. “Ata-ur Rehman’s ban is off; Herschelle Gibbs and Shane Warne are still playing, but I am stuck. Other Pakistani players whose names appeared in the investigations were fined and let off. Only I was punished. I guess they wanted a scapegoat and who better than me. In India, the Board thought Azharuddin would be the ideal person to ban because he was nearing the end of his career, and here in Pakistan I was coming towards the end of my career. So, Azhar and I were made the scapegoats,” he laments. Leading the life of a recluse now, Malik keeps changing his mobile number on a regular basis, and is quite paranoid about meeting people, particularly those who wish to probe him about the match-fixing episode. “Please don’t cook up any story about my presence here for match-fixing purposes prior to the third Test. I was preparing to runaway from here so that I do not bump into any player,” he told The News jokingly. Malik filed an appeal with the Supreme Court in Lahore after failing to get the ban overturned at the civil, district and high court levels. Malik is only one of three Pakistani players to have played 100 Tests along with Javed Miandad and Wasim Akram and till today he believes that there are some players in this team who didn’t want him to come back into the fold. * The architecture of the Indian desert state of Rajasthan, famous for its arches and other traditional designs, has mesmerised people worldwide, including a Pakistani cricketer who redesigned his home after his visit to Jaipur in the 1980s. After his first visit to Rajasthan’s capital to play a Test match against India in 1987, Rameez Raja left the Pink City completely captivated by the designs of its age-old buildings and palaces. So much so that when he returned home, he had his Model Town home in Lahore specially redone on the pattern of the arches and other deigns for which Rajasthan is well known. “I wish you could come over and see what he has got done at home,” said the wife of Raja, a former Pakistan captain and currently chief executive of the Pakistan Cricket Board (PCB). “We don’t have a big house but it has been neatly done,” added the lady who is also a keen cricket follower. * Some people are quite particular about which direction their window opens to. Former India wicketkeeper Syed Kirmani, for instance, seems to prefer the window of his room opens on to a green field rather than a concrete wall. Currently chairman of India’s senior selection panel, Kirmani, who was here to watch the second Test, stayed at the beautiful residential complex of the PCB’s National Cricket Academy (NCA) before travelling to Karachi to meet his relatives. He was initially put up in a room whose windows faced the building that housed the indoor net practice facilities. Using his forthright and friendly demeanour, Kirmani requested the administrators to shift him to another room whose window faced the cricket field. Harbhajan Singh practices at Bultron Park Cricket Stadium in Jalandhar on Sunday. “I will like to play as many as tournaments, as possible to gain full control over line and length”, he added. Asked about the reasons of the defeat in second Test at Lahore, Harbhajan, who missed the historic tour to Pakistan because of his injury, gave umpiring as one of the reasons for the defeat. “There were some close controversial decisions, including those of Imran Farhat, Inzamam-ul-Haq and Yousuf Youhana”, he added. Harbhajan congratulated his teammates for winning the one-day series and expressed the hope that the Indian team would win the Test match series also. Lauding the role of Pakistani viewers, who wholeheartedly supported cricket impartially, he said, “Ultimately, it is the game of cricket which will win, as finally this game has proved to be a medium to improve relations between the two countries”. On the absence of Umar Gul, who performed well in the second Test, Harbhajan said it was a setback to Pakistan. Looking like a true world-class act for the first time in the series, the West Indies captain was undefeated on 86 to lift West Indies to 208 for two when bad light stopped play. West Indies vice-captain Ramnaresh Sarwan was not out on 41 and shared an unbroken stand of 110 with Lara for the third wicket to add substance and stability to the wobbly batting. With England’s bowlers emasculated by the friendly nature of the pitch and not benefitting from the same appreciable bounce and movement they gained in the three previous Tests at Kingston, Port of Spain and Bridgetown, West Indies bullied their way to a confident position at close. Chris Gayle earlier set the tempo for West Indies with a pulsating 69 that included 12 boundaries from 80 balls in two hours. Takao Suzuki and Gouichi Motomura posted reverse singles wins today as Japan came from behind to defeat India, 3-2, in their Davis Cup Asia/Oceania Group I clash. The Japanese win over India has come in after 74 years, since their last victory in 1930. 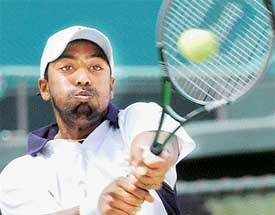 Suzuki defeated Prakash Amritraj 6-4, 6-3, 6-2 at Utsubo Tennis Center in the first match and Motomura sealed the Japanese win with a 6-4, 6-3, 7-6 (4) win over Leander Paes. India has won 17 of the 19 clashes the two countries have had. The Japanese bagged victory twice with the Indians, and both were during the initial days of their confrontation, about seven decades ago. After winning the doubles rubber yesterday, India held a 2-1 lead in the second round tie, but it wasn’t enough to hold off the host nation, which advanced to September’s ties for possible World Group qualification. Motomura, who defeated Amritraj on Friday, cruised through the first two sets before Paes came to life and forced a tie break. Motomura took a 4-0 lead in the tie break. Paes tied it up but Motomura broke serve once and then won with a brilliant crosscourt forehand. In today’s first match, Suzuki built up a comfortable lead and then won the third set with a lob over the head of Amritraj to close out the match in 2 hours and 14 minutes. The Indians, who suffered a jolt in the third minute of the match when M. Ikramov scored, fought back gallantly to register their second successive win in Group C, according to information received here. India restored parity in the 41st minute through striker Abhijeet Dey, who scored again a minute later to give his team the lead, converting two fine passes from midfielder Sanjay Boro. World number one Woods fired his second three-over par 75 in three days here yesterday to stand on three-over 219 after 54 holes at the Augusta National Golf Club. He began the day six strokes off the lead and ended it nine off the pace in a share of 20th place. Reminiscent of the 1920s and 1930s era, these vehicles, ranging from the 1933 Ford Tourer, the 1948 model of Chevrolet, the 1928 Ford, the 1954 Standard, the 1968 Mercedes, the 1968 Chevruf, the 1946 model of Vauxhau and a host of other cars, hit the roads, which was a treat for onlookers to see the old favourites in action. The drive was flagged off from the Kasauli Resorts’ Chandigarh office at 9.45 a.m. by Captain Chimni and Captain Ahluwalia, directors of the resorts. By afternoon, the old but enthusiastic drivers of about 20 cars had traversed more than the 1,000-m highway to make their presence felt in the cantonment town. Delighted at the response received for the rally, the president of the Vintage and Classic Car Chandigarh, Brig (retd) J.S. Phoolka, said more such events would be organised to promote tourism in Kasauli having organised five such rallies, he said the more than five years old club was hopeful of receiving more entries next year. 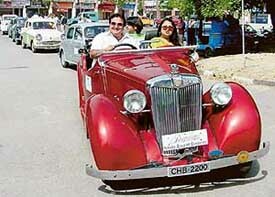 Twentytwo-year-old Nagina Singh, driving her 1933 maroon Austin, was all praise for the drive. Recalling her experience, she said it was for the first time that she had ever noticed the chirping of birds. Lost in the din of blaring car steroes of luxury cars, these natural pleasures had been left unnoticed. Not only had the pine-whiffed mountain air enthused her, but the occasion was a pleasure trip away from the hustle and bustle of city life. Being non-competitive, the drivers had a gala time ascending the high terrain. Capt P.S. Chimni said they would make it an annual feature and expected the Tourism Department to initiate a few such ventures to promote tourism in this quiet town. The Deputy Director Tourism, Mr Manoj Sharma, while reacting to the good response received at the rally, said the district administration could promote more such events, which would be ably supported by the Tourism Department. Pleased at the response received, the general manager of the resort, Mr Rocky Chimni, said the place had an immense scope for tourism, which if adequately utilised, could come up as an ultimate tourist destination. Despite the worn-out engines and old mechanics of the vehicles, the vintage cars managed to reach Kasauli. The academy comprising 20 regular trainees and five stand-byes will initially start functioning for a period of two months from April 15. “The academy will have the best talent available with the likes of Shekhar Dhawan, the Delhi batsman who excelled in the recent under-19 World Cup, among the trainees,” Bhupinder Singh, Punjab Ranji team coach, and one of the three coaches appointed for the academy, said. The training schedule as chalked out by the BCCI and being followed at the National Cricket Academy headed by Brijesh Patel in Bangalore will be followed. The trainees will have the services of a yoga expert as well as a physiotherapist, Bhupinder said. Bhaskar Pillay, former prolific Delhi batsman and Yoginder Puri, a SAI coach, and Bhupinder will impart coaching to the trainees. PSB skipper Baljit Singh Chandi, who missed the first shot for his team in the tie-breaker today, was awarded the most valuable player of the tournament award that carried a cash reward of Rs 10,000. PSB had earlier lifted the Cup in 1999 and 2000. However, the final never rose to any great heights and PSB that boasts of six India internationals did not give a display that matched their reputation. After a dull drab display of stickwork for the full time and then the extra time during which none of the teams had a clear look at the goal, the game rolled into tie-breaker. For Mahindra goals came through Raphael Patron Akakpo in the 43rd minute Abhishek Yadav in the 53rd minute while for Salgaocar lone goal came in the 31st minute through Tomba Singh. Power Colony, Ropar, won the Ropar Subjunior Football Tournament beating Kurali 2-1 in the final played at Ropar today. The SDM, Mr Daljit Singh, gave away the prizes. Among those present on the occasion was Arjuna awardee Inder Singh.